The 24-30 September was Red Squirrel Awareness Week 2018, a great time to look out for distinctive russet fur, tufted ears and a twitching tail. To celebrate this iconic British mammal, APHA’s squirrel experts have written a blog post highlighting the diversity of their research. But first, let’s start by setting the scene. The red squirrel (Sciurus vulgaris) is the only squirrel native to Britain. Like many other species that settled in Britain at the end of the last Ice Age c.12,000 years ago, the red squirrel has been facing strong challenges against its survival ever since, having to adapt to a constantly changing forest landscape and a heavy hunting pressure by humans until the beginning of the 20th century. Non-native grey squirrels (Sciurus carolinensis) were introduced to England from North America in 1876 as an ornamental species in the grounds of stately homes. Around 30 separate introductions occurred until 1930 when the damage caused by the grey squirrel was recognised. The population of grey squirrels flourished to a current estimate of 2.5 million. Under the Wildlife and Countryside Act 1981 (schedule 9) it is now illegal to release a grey squirrel to the wild. Today, the grey squirrels have replaced the red squirrel across much of the British Isles, with Scotland supporting over three quarters of the estimated 140,000 population of red squirrels that are thought to reside in the UK today. Why is that? Grey squirrels have out competed the reds quite substantially and have proved to be better adapted to living in British broadleaved woodlands. With a digestive system hardier than that of their native relative, grey squirrels are more efficient at digesting seeds with high tannin content such as acorns. In addition, the presence of grey squirrels results in a reduction in red squirrel fitness which was evident by lower population summer breeding and a lower recruitment (Gurnell et al. 2004). 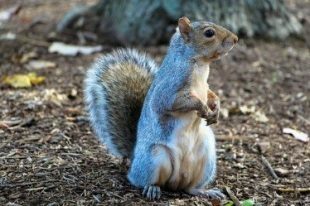 Grey squirrels also maintain an advantage because they are resistant to the squirrelpox virus (SQPV) that they often carry (greys have developed immunity to the disease having been exposed to the virus for many centuries). The disease is invariably fatal when transmitted to red squirrels and the population decline in red squirrels has been estimated 17 - 25 times higher in regions where the virus is present in greys (compared to competition from greys alone). The first squirrelpox disease case was detected in a red squirrel from Norfolk in 1980, but the virus had undoubtedly been present but undetected in the population for a number of years. Thanks in great part to breakthrough work carried out at APHA’s Pathology Department, over 525 SQPV cases have now been detected across the UK, in northern English counties, primarily Cumbria and Northumberland and also in the Formby coastal woodlands of Lancashire. 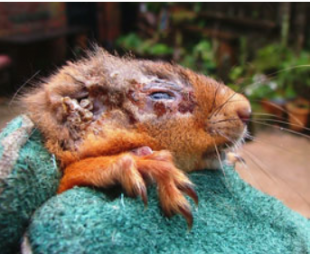 Adenovirus (ADV) is another emerging threat to red squirrels. Unlike SQPV, ADV cases have been found on the grey squirrel-free island strongholds of Anglesey, the Isle of Wight and Jersey and since the first recognised ADV case in 1983, over 230 cases have been seen in the four home countries. 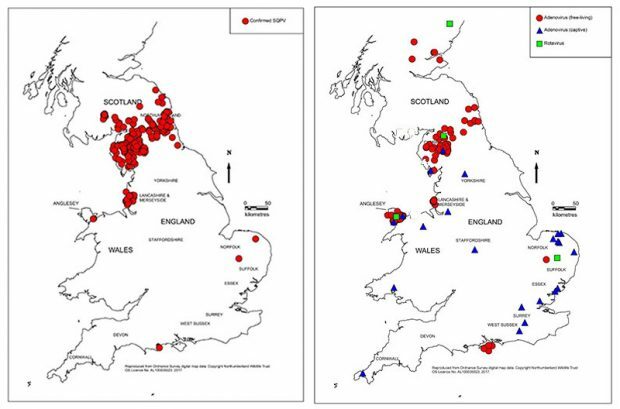 Red squirrel case location maps for both SQPV and adenovirus (including the rotavirus cases we have detected) up to November 2017. Maps produced by Northumberland Wildlife Trust (© Simon O’Hare). On the left-hand map, red circles denote confirmed SQPV cases. On the right-hand map, red circles represent adenovirus positive squirrels in wild populations, blue triangles adenovirus positive captive squirrels and green squares are rotavirus positive cases. The detection of SQPV and ADV viral presence was originally by identification of viral particles in pathological cases involving the use of transmission electron microscopy (TEM). Confirmation of identity of the particles through TEM is by size, shape and surface morphology. However, TEM does not allow to differentiate strains of the same virus in a sample as one strain looks much like another under the microscope. However, our experience shows that we are unlikely to detect viral particles in samples from healthy animals by TEM, so an asymptomatic viral presence in these circumstances would go undetected. The advent of the molecular assay, using polymerase chain reaction platforms, has alleviated this missing surveillance element and these assays being more sensitive than TEM have allowed a clearer picture of viral presence to be determined for ADV and SQPV in both squirrel species. This has allowed mitigations to be incorporated to reduce infection presence at the red/grey squirrel interfaces. During localised outbreaks of SQPV or ADV, typically only 5 to 10% of bodies are normally recovered with the remainder lying undetected in dreys (nests), in thick vegetation or being predated. We thus likely underestimate the true incidence of these viral infections, producing but a snapshot of the full picture, but no less highlighting the current plight of the red squirrel. The presence of the grey squirrel carries a significant economic and environmental impact, estimated to be in excess of £10 million per year (Mayle and Broome 2013). They cause substantial damage to forestry through bark stripping that affects tree growth and timber value and increases the susceptibility of trees to various pathogens. Reducing the number of grey squirrels is the only method to decrease the impact of this species both economically and on our native reds. Fertility control has been proposed as a humane, publicly acceptable and cost-effective method for reducing populations of grey squirrel (Dunn, Marzano et al. 2018, Massei 2018). 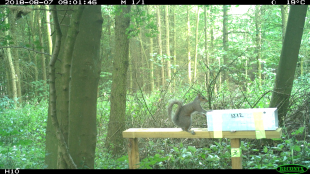 The APHA’s National Wildlife Management Centre (NWMC) is now in the process of delivering the second year of a five year project, funded by Defra and the UK Squirrel Accord, aimed at developing and delivering oral contraceptives to control British grey squirrels. This includes developing an existing contraceptive, already successfully tested by the NWMC in laboratory trials, and developing methods to deliver this contraceptive safely and effectively in the field. One of the most important components of developing an oral contraceptive delivery method is to ensure that it is specific to the target species in question, so that the bait containing the contraceptive cannot be eaten by other wildlife species. This has been where much of our research into the field delivery has been focussed so far and is a necessary step to enable the deployment of any contraceptive in the future. We developed a feeder that can be accessed by grey squirrels through the use of a metal tunnel and a weighted door that has to be lifted in order to access the bait. We will test this feeder in areas where red and grey squirrel coexist. Another important factor to consider when designing a successful delivery method is the pattern of bait uptake by the target wildlife population e.g. the proportion of the population that will eat a given bait and how often each individual will eat a bait. Factors such as these will determine the effectiveness of any contraceptive deployed. 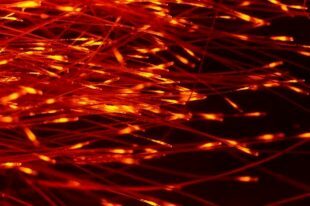 We used a bait marker, Rhodamine B, that when consumed as part of a nut paste bait, is incorporated into the hair and causes it to fluoresce under UV light. This allows us to determine which squirrels have ingested the bait. Fluorescence in the flank hair of a grey squirrel that consumed bait containing the marker Rhodamine B (©APHA). This highlights that non-native species can adversely affect our native fauna, and these effects may only come to light after many years, and also demonstrates how APHA are at the forefront of the humane management of wildlife populations.